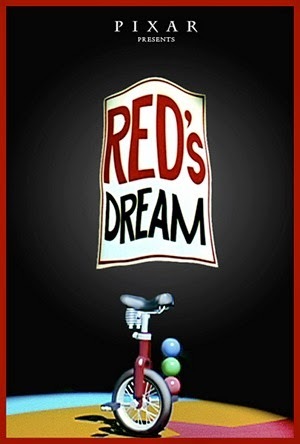 As a follow-up to their first animated movie, 1986’s Luxo Jr., John Lasseter and the crew at Pixar produced Red’s Dream, a short about a small red unicycle that remembers better days. It’s a rainy night in the city, and sitting in the corner of a neighborhood bicycle shop is Red, a small unicycle that nobody seems to want. It wasn’t always like this for Red. At one time, he was part of a circus act, and was ridden by a juggling clown. In fact, Red was more than just a prop; he was a big part of the show (turns out Red was even a better juggler than the clown). Feeling alone and unwanted, Red looks back on his glory days, all the while realizing that his five minutes of fame are at an end. Right off the bat, Lasseter sets a somber tone for Red’s Dream, opening in the quiet streets of a rain-drenched city as a single, mournful saxophone fills the soundtrack (for some reason, lonely city streets at night and solo saxophones were a common pairing in the ‘80s. I recall similar moments in Against All Odds, The Pope of Greenwich Village, and Streets of Fire, just to name a few). The mood perks up a little when Red reminisces about his past achievements (the clown perched atop Red during the flashback sequence is a tad wonky, and is the only bit of animation in the entire short that’s off-kilter). The Pixar team even manages to get a laugh out of us when Red moves one way while the clown, still peddling in mid-air, veers off in another direction. But alas, the good times don’t last long, and the final moments of Red’s Dream are sure to tug at your heartstrings. Unlike most of the studio’s other shorts (i.e. Geri’s Game, For the Birds), Red’s Dream was never attached to one of their feature releases, and is available only on home video. But like all of Pixar’s early offerings, it’s well worth seeking out.